Kevin Quinn and Mickey Rivera were killed in a head-on crash in Cotuit early Saturday; Jocelyn Goyette died from her injuries on Monday. Quinn, a Marine veteran, was on his way home from visiting his wife Kara and newborn daughter Logan at Cape Cod Hospital. Mashpee police confirmed Monday that officers were pursuing Rivera. 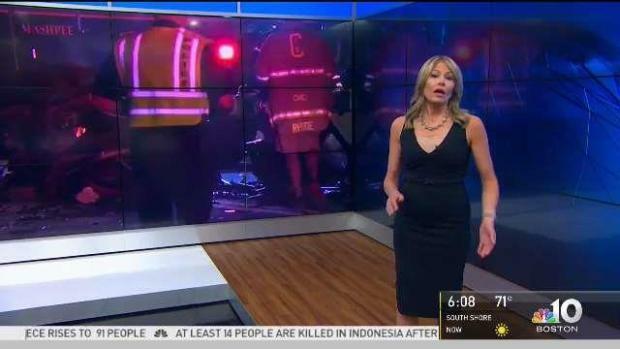 Police confirmed Monday that they were pursuing a vehicle when it crashed head-on into an SUV on Cape Cod shortly after midnight Saturday, killing three people. Kevin Quinn, 32, of Mashpee, and Mickey Rivera, 22, of Fall River, died in the collision on Route 28 in Cotuit. Rivera's passenger, 24-year-old Jocelyn Goyette of New Bedford, died on Monday at a hospital in Boston. Mashpee police said they were chasing a car driven by Rivera but would not say what launched the pursuit. Police radio reports indicate the chase began following a report of erratic operation and speeding. Quinn, a Marine veteran who served two tours of duty in Afghanistan, was returning home from a hospital visit with his wife, Kara, and their first child, Logan, who had been born on Wednesday. He was expected to return to Cape Cod Hospital on Saturday morning to bring home his wife and daughter, according to a GoFundMe page set up for the family. All three victims are dead after a crash early Saturday morning in Cotuit, Mass., including Marines veteran Kevin Quinn. 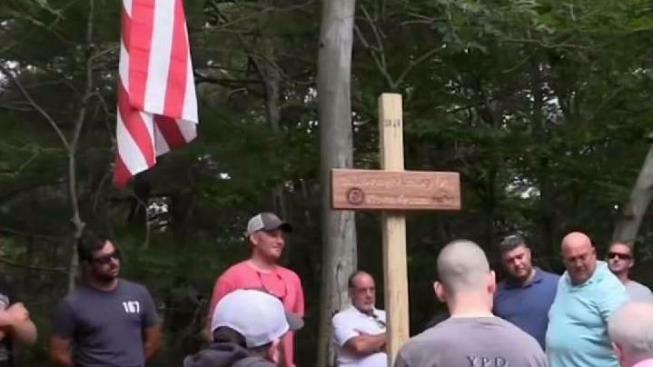 "He was a very loving son, an awesome husband, and was so proud to be a dad," said Janet Quinn, Kevin's mother, at a roadside memorial unveiling a cross in her son's memory. "That truly will be his legacy, his daughter." Friends of Quinn who placed American flags on the road where he was killed in his 2012 GMC SUV said they had few words to describe the tragedy. "I just felt like I got hit in the chest with a sledge hammer," family friend Rob Dinan said. "I just couldn't believe it. "Thankfully, he got to at least spend a couple of days with the baby," he added. "It's just an unbelievable tragedy," said Denise Kalbach. "He was killed by someone who was running from the police." Authorities said police in Barnstable responded just after midnight Saturday for a report of a crash with multiple victims, entrapment, a car fire and an ejection on Falmouth Road. A U.S. Marine veteran was on his way home from visiting his newborn daughter when he was killed in a car crash. When officers arrived, they found Quinn pinned inside his SUV. He was extricated using the Jaws of Life and taken to South Shore Hospital, where he later died. Rivera was in a 2000 Toyota sedan, which split in two as a result of the crash. Both he and Goyette were ejected from the car, which was on fire when crews arrived at the scene. Rivera was pronounced dead at the scene. Rivera had a history of prior offenses, according to law enforcement officials. In March 2015, Rivera was charged with armed and masked home invasion, armed assault and assault and battery with a dangerous weapon in connection with the stabbing of two women in Taunton involving several different defendants. The case against Rivera was dismissed because the victims could not identify him. He was also due back in court this week on armed robbery and witness intimidation charges out of Fall River, also dating back to 2015. He was free on bail at the time of the accident after his bail was recently lowered. Goyette worked as a certified nursing assistant, according to her family. 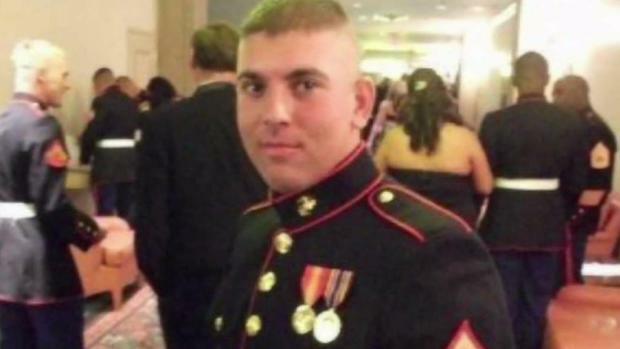 Kevin Quinn, a Marine veteran who was driving home after visiting his wife Kara and their newborn daughter at Cape Cod Hospital, was killed when his SUV was hit head on by another car. Both the Mashpee and Barnstable police departments said in statements that they extend their sincere condolences to the families and victims of Saturday's tragic accident. Quinn's friends are raising money for his wife and daughter, with more than $150,000 raised already. They said there are no words for the community's support. "To have this happen and have the outpouring of support we have for him, it's just beyond words," Dinan said. A funeral for Quinn will be held on Monday, Aug. 6. He will be buried with full military honors at the Massachusetts National Cemetery in Bourne. There was no immediate word on burial plans for Rivera.